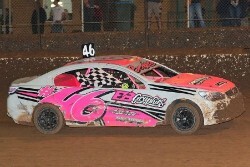 National Champion, Anthony Beare has won the MJS Street Stock Grand Final, at the Murray Machining and Sheds Murray Bridge Speedway, with a convincing win in the 30 Lap A Main on Saturday night. After six qualifying heats, Beare and Mark Gartner would start on the front row, with Sam and Justin Brumfield on the second row. Ultimately Beare would lead all the way, with Gartner in second place until lap twenty when he met his demise finishing on the infield, which elevated Sam and Justin Brumfield to second and third respectively. The pair had a good battle for the minor placings as Beare had opened up a quarter of a lap lead. Beare, who set his quickest lap of the race on the opening lap, won easily, recording his seventh Feature win of the year. Sam Brumfield just held off Justin Brumfield for second place, with Steve Gartner, likewise, just holding off Neville Nitschke for fourth. Results of the series will be announced at a function to be held later in the season. A Main, 30 laps: 1. S46 Anthony Beare, 2. NT15 Sam Brumfield, 3. NT5 Justin Brumfield, 4. S32 Steve Gartner, 5. S58 Neville Nitschke, 6. S14 Nigel Reichstein, 7. S87 Jayden Edwards, 8. MDA83 Scott Mason, 9. S27 Cade Cox, 10. S59 Haydon Jolly, 11. S2 Anthony Buchanan (29). DNF: S17 Carey Weston (28), S25 Mark Gartner (28), V22 Corey Sandow (19), S23 Ben Whitehead (18), S62 Trae Ballantyne (17), S82 Heath Thorne (15), MDA29 Nathan Thorne (15), S55 Ben Tuttle (9), S7 Craig Buchanan (1). Total Time: No Time. Winning Margin: 3.352. Fastest Lap: 16.633 S25 Mark Gartner.